Carpal tunnel syndrome is a condition caused by a pinched nerve in the wrist, causing numbness, weakness, and pain in the hand. Heredity/Race – carpal tunnels are smaller in some people, and this is usually hereditary. Anatomic factors – aside from heredity, the carpal tunnel space may become smaller in cases of wrist fracture, dislocation, or arthritis exerting pressure on the median nerve. Chronic conditions such as diabetes, wherein there is increased risk for nerve damage, including the median nerve. Medical conditions such thyroid problems and kidney disorders. More common in women than in men, probably because the carpal tunnel is relatively smaller in women. More common in older people, with a peak age range of 45-60 years. Hand use and workplace factors – prolonged or repetitive flexing of the wrist (keyboarding and excessive mouse use), or working with vibrating tools may damage the median nerve. 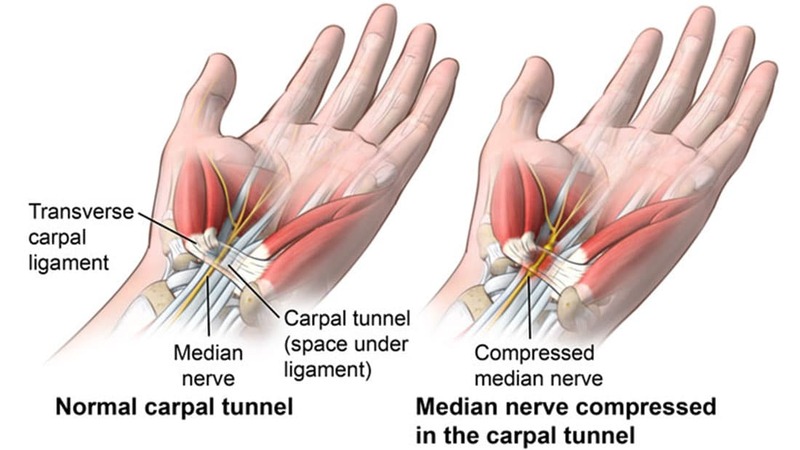 Compression of the median nerve causes tingling, numbness, weakness of the hand, which we call carpal tunnel syndrome. Tingling or numbness – in the thumb, index, middle and ring fingers, except the little finger. This sensation may radiate from the wrist to the arm. With early diagnosis, these conservative managements would be very useful in slowing or stopping the progression of the disease. Bracing or splinting – to keep the wrist from bending, especially during sleeping or other activities where symptoms grow worse. Non-steroidal anti-inflammatory drugs are helpful in relieving pain and inflammation. Corticosteroid injection – decreases swelling and inflammation, relieving pressure on the median nerve, therefore relieving the symptoms. In cases where the condition is becoming constant and severe, and the nonsurgical treatments have not been effective, surgery is often advised to prevent permanent nerve damage. However, the risks and complications should be thoroughly discussed with your physician. Endoscopic method – a small incision is made to insert a small camera (endoscope) which cuts the transverse carpal ligament. Open Surgical technique – a cut is made in the palm, and the ligament is divided to increase the size of the tunnel, decreasing pressure on the nerve. If you exercise, stay at a healthy weight, control other health conditions such as arthritis and diabetes, and avoid smoking, you can help prevent carpal tunnel syndrome.